What is one thing you learned at Rutgers that has helped prepare you post-graduation professionally or personally? : Since Rutgers is so large, I learned that there are many channels to network with others (either for fun or for work) including events, clubs, databases, websites, research, etc. Due to this exposure, I became much more resourceful in utilizing similar channels in other settings which has helped me to attend the top public health graduate school, get elected to the board of professional organizations, make new friends, travel, and much more. What is a part of your identity that you discovered while at RU (passion for something, political beliefs, etc)? : Professionally, I discovered my passion for health policy & systems change. Personally, I embraced diversity much more. How has your Rutgers education or network help get you where you are today? : There have been so many ways! 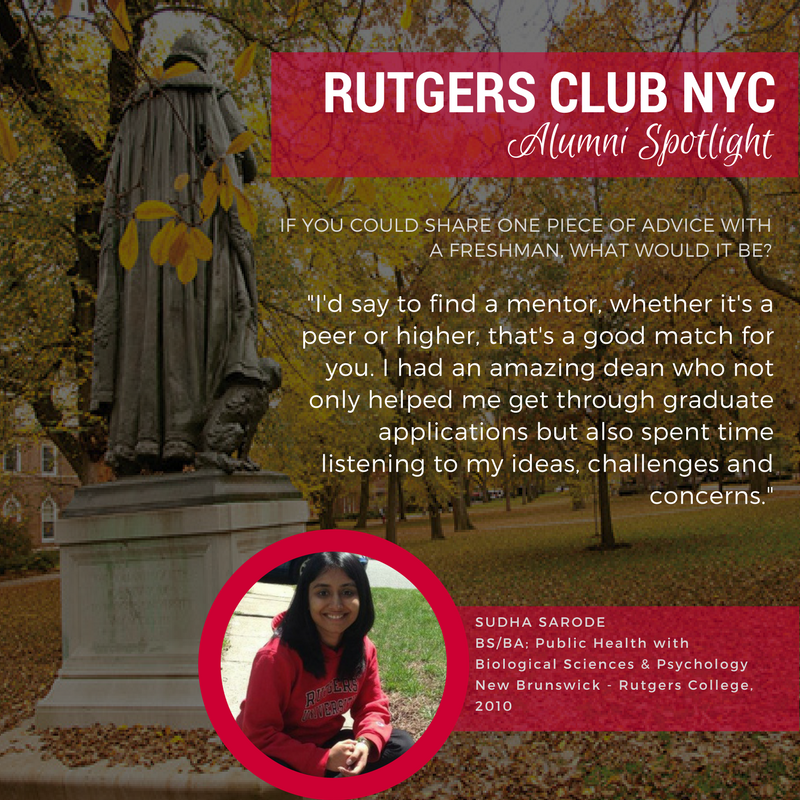 As an example, the Rutgers Club of NYC helped me to get acclimated, make new friends and feel at home when I first moved to NY. It offered monthly networking, weekend game watches and much more. If you could share one piece of advice with a current freshman, what would it be? : I’d say to find a mentor, whether it’s a peer or higher, that’s a good match for you. I had an amazing dean who not only helped me get through graduate applications but also spent time listening to my ideas, challenges and concerns.